Ken the Reporter in the Wario's ending of WarioWare, Inc.: Mega Microgame$!. 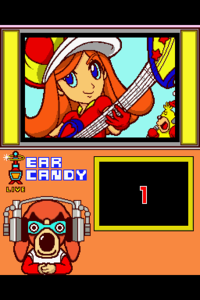 Ken the VJ as the host of the show Ear Candy in WarioWare: Touched! Ken the Reporter (also referred to as Anchorman Ken) is a recurring character from the WarioWare series. He is a humanoid dog, and his name, Ken (犬) is a word that means dog in Japanese. 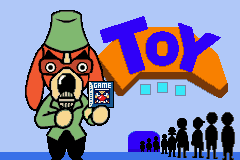 He first appears in WarioWare, Inc.: Mega Microgame$!, and he could actually be considered the cause of the entire WarioWare series, as he is the one who broadcasts the newsflash telling how the creators of Pyoro had made millions because of the videogame, inspiring Wario to create his own games. He later appears at the end of 9-Volt's level, telling the world that the Game Boy Advance SP is available for purchase. He finally appears at the end of the game, broadcasting Wario's success via television. This page was last edited on September 24, 2018, at 19:04.